BJ Williams is lucky to be alive. The Longmeadow man was a passenger in his friend's pick up truck driving down the Massachusetts Turnpike in 2005. The then 21-year-old was not wearing his seat belt. The local hockey star thought he was invincible. "If I could block a slapshot at 80 miles an hour, break bones and still play - what's gonna hurt me?" Williams said. That all changed when he was ejected from a truck in a terrible crash. He suffered a traumatic brain injury and still struggles with balance. He has no sense of smell or taste and is deaf in one ear. 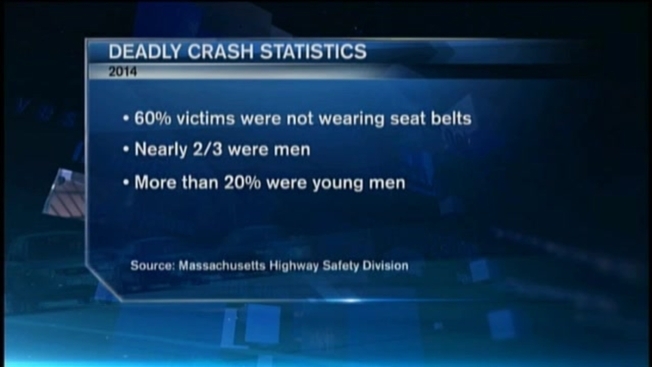 "Massachusetts seat belt use is about the worst in the nation - 32 - and people are getting hurt and dying because of it," said Jeff Larason of the Massachusetts Highway Department. In 2014, 60 percent of people killed in crashes were not wearing seat belts. Nearly two-thirds of those killed were men. More than 20 percent were young men. The Highway Safety Division of Executive Office of Public Safety and Security is launching a new Click it or Ticket Campaign targeting men aged 18 to 34. Joined by 200 local police departments, Massachusetts State Police is leading enforcement in the campaign. On a recent Friday, they tag-teamed along Route 9 in Framingham. One trooper acted as a spotter, while three others pulled drivers over. Cliff - who didn't want to give his last name - was pulled over for allegedly texting behind the wheel, which he denied. But he said he hardly ever wears a seat belt. Opioid-Related Deaths on the Rise in Mass. BJ Williams says it's that thought - that you can't get hurt - that can get you killed. "There are things we can do to change it, and save people's lives - we absolutely can."